How to take care of a pet bird. Bird guide with everything you need to know to take care of your pet bird from bird supplies and food, to exercise, safety and bird health care. What is the right bird for me? Learn about pet birds and finding birds for sale. Looking for a young pair of genuine Spanish Timbrados to breed. When the Sun Conure is fully mature and has all its coloring it is gorgeous, but even juveniles are extremely pretty! "Widget" is an exceptional Sun Conure. He loves to do tricks with his owner and is very playful and affectionate. Sometimes "Widget" sleeps, or plays "dead bird" in his owners hand. He loves to hang out and he is free to fly about, but when he's ready for a break he always goes back to his cage. "Widget" is fun to be with, fun to play with and fun to look at! These birds are native to Guianas to northwestern Brazil. The Sun Conure, a small member of the parrot family, is one of the most colorful of the conures. Their nice personalities and their gorgeous coloring make them a favorite pet. There are a variety of conures, and most make excellent pets. They vary in coloring and size, the Nanday Conure, for example, is a larger conure with a black head and green body. For a smaller bird and a great pet, a conure is a great choice. These birds get up to 12" (30 cm). A roomy cage is required unless the bird is to be let out for extended periods. Many birds can spend most of their time on a play pen or parrot perch. They eat a variety of sprouts, seeds, nuts, fruits, vegetables, and commercial pellets, as well as the same nutritional foods humans eat. See About Conures: Housing and About Conures: Care and Feeding for more information. They live in pairs or small groups of 10 to 20 birds. They love to play, and can be fairly destructive if not watched. They can also be rather noisy. Despite all this, they make a real fun pet and are very popular. Activities: Loves to climb and play. Provide lots of toys. They breed readily if they have the right size aviary. The hen lays four eggs which are incubated for about 26 days. The young fledge (leave the nest) after about 8 weeks. The nest box size should be 12" x 12" x 12". Potential Problems: As with most Aratinga species, this bird can be noisy. See About Conures: Potential Problems for information on illnesses. This bird is generally available. They can usually be found at pet stores and reputable breeders. I have Five Sun Conures. I started off with two and they had three eggs which all hatched and the babies are about 1 year old. Now they have laid another two eggs and I am worried, becuase that is enough birds for me. Does anyone want sun counures? or how i can stop them from breeding? Hi how much are u saleing them for...i would get some fake eggs and put them in there..
Where are you located? I have a jenday and 6 lovebirds, would love another. Where are you located? I would love to have a sun conure but I have yet to convince my parents to let me get a parrot. How much are you selling them for? I would love to have another Conure. My husband and I are retired. We share "parental rights" of our sun conure, Lupe with our adult son. We are crazy about her ('her'...she's never been sexed). She loves to preen herself and US!! I believe she thinks my son's girlfriends bun is a bird nest. She flies to it frequently when Kayla is in the room. Message me back if you have a chance. Let me know if you have birds available. Also, update me on your original pair. Are they still doing well? Where do you live? 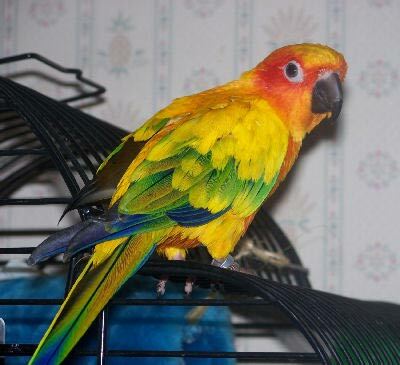 I am very interested in finding a Sun Conure to join our family> I am in ca. We LOVE BIRDS!! We have loved them ever since we were children, my husband and I. We always had birds growing up. it became a family thing. All my kids help and get involved. we do have all type of Conures from 2 months to 1 year old. I am extremely interested in hearing more about your sun conures. I am a senior citizen, at home 24/7, offering all the love, time and attention that they could possibly need. living on only social security may put me out of consideration but my love is unending so I hope that I will hear from you a.s.a.p. thanks for your time and consideration. I believe that I have the most spoiled Sun Conure of them all. His name is Tuki, he is two and a half years old. For a bath I run water from the sink faucet, he walks down to my hands, lowers his head and crouches down-waiting. I then have to move my hands under the stream of water, back and forth, side to side, so that Tuki gets wet. He goes up and down my arm to give a quick shake and then back down for me to navigate his body for optimal shower enjoyment. upon bath completion, when we are both thoroughly saturated, it is time for drying. Tuki shakes once or twice then essentially sits and waits to be dried. we go into the bathroom so that i can dry him with a hair dryer. he sits on a curtain rod and positions himself, turning front and back, lifting his wings, making sure i don't leave any wet spots.